Product Details: The ŠKODA PID unit enhances the functionality of the Citigo by offering navigation, so you can meet your friends anywhere. Hands free calling via Bluetooth so you are never out of touch and always up to date with the latest gossip. 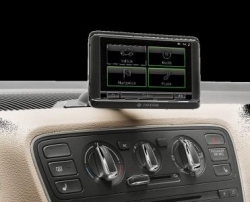 PID enables you to stream music from your phone via Bluetooth, so you and your music can go anywhere together; no trip is boring or too longwinded when you have a PID. Sleek, slim and lightweight design. Pan-European navigation in 44 countries and 25 languages. Bluetooth hands-free calling including voice recognition. Connect up to two mobile phones. Media centre including Micro SD card slot (upto 32GB, SD card not included). A2DP wireless music streaming and image viewer. Connects to the cars CANBUS to display trip computer information including; speedometer, rev counter, temperature and visual parking sensor display (compatible with factory installed parking aid).